JKing Artificial Plastic Mixed Fruits Pack of 10 Simulation Plastic Decorative Fruits Display by Ⓜⓔⓘⓛⓘⓢⓢ at Home Decor Outlet Store. MPN: unknown. Hurry! Limited time offer. Offer valid only while supplies last. ♘ These Meiliss Life-like artificial plastic mixed fruits.Great looking and lifelike fruits,you may be want to eat it! ♘ So delicious and sweet. ♘ These Meiliss Life-like artificial plastic mixed fruits.Great looking and lifelike fruits,you may be want to eat it! ♘ So delicious and sweet. ♘ They are 10 different kind of fruits. ♘ Package including kiwi,orange,green apple,peach,red apple,purple grape(36 grain),banana,yellow lemon,red delicious apple and purple grape(60 grain). ♘ The fruits are detailed, durable, and realistically sized. More,bright colors, looks so real and nature. And, They are great for home kitchen ,party ,festive and holiday decorative use,teacher learn in kindergarten, shop display etc. ♘ Also can be a great creative gift for friends or family. So wonderful! ♘ Note:the picture basket does not include in package. ㊝ These Meiliss Life-like artificial fruits,looks real and beautiful. ㊝ Material : durable high density poly plastic foam. ㊝ Great for home kitchen,party,festive and holiday decorative use. 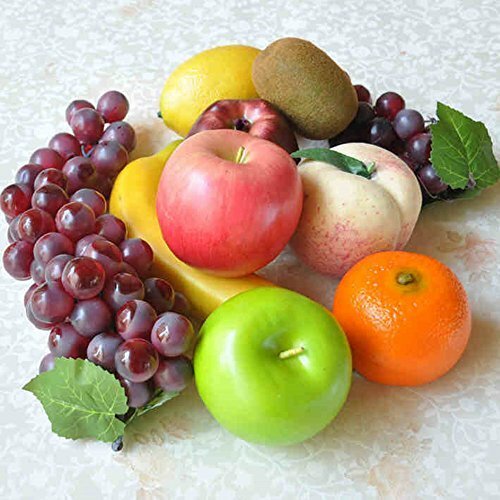 ㊝ Package included 10 of different fruits-kiwi,orange,green apple,peach,red apple,purple grape(36 grain),banana,yellow lemon,red delicious apple and purple grape(60 grain). Note:the picture basket does not include in package. View More In Artificial Fruit. If you have any questions about this product by Ⓜⓔⓘⓛⓘⓢⓢ, contact us by completing and submitting the form below. If you are looking for a specif part number, please include it with your message.